Saturday represented two months to the 2014 IIHF World Junior Championship in Malmo, Sweden. During the excitement of the early season, it’s easy to forgot just how short these two months will be. Most candidates for the U.S. National Junior Team are already at least three weeks into their season, which combined with their time at the National Junior Evaluation Camp in the summer is starting to clear up the picture of who might be making Team USA. There’s still plenty of work to be done, but the next five weeks will be crucial for any player with hopes of making Team USA. The preliminary roster, which can vary in size, usually between 25-29 players, will be announced in early December, with the pre-tournament camp being held at the University of Minnesota Dec. 15-17 before moving on to Sweden. So while it may seem early to start the WJC watch, it’s not as early as you think. So (almost) every week from now until Team USA’s preliminary roster, we’ll have the U.S. World Junior Watch, often highlighting a few particular candidates and checking whose stock is rising or falling as of that week. The U.S. World Junior Watch won’t always be this comprehensive, but since we’re catching up with the first month of the season, there’s so much to get to. Though lengthy, this doesn’t touch on all prospects, so look for more info in future World Junior Watch pieces for updates on other candidates. One of the biggest storylines about this team is who won’t be there, as much if not more than who will be there. Team USA is sure to be without Alex Galchenyuk, who is off to a fantastic season with the Montreal Canadiens, and a vital part of their lineup. The same goes for Seth Jones who is playing top-pairing minutes for the Nashville Predators. Though GM David Poile is loyal to USA Hockey, he and everyone else knows Jones doesn’t need the little developmental boost the WJC can provide for a player. Jones is already getting that at the NHL level and performing splendidly. Jacob Trouba is another one that is almost certainly not going to be available to Team USA, though the significant injury he suffered last week makes his situation a little more difficult to predict. Trouba went head-first into the boards and suffered a neck sprain, thankfully just a sprain after how scary that play looked. He is going to be reevaluated after two weeks in a neck brace, so when he can return is very much up in the air. 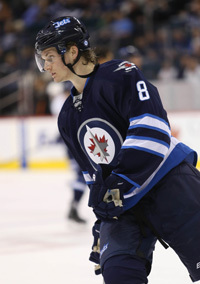 If Trouba is out any extended period of time, the Jets could consider using the WJC as a bit of a rehab assignment almost, but the way Trouba played in his first eight games suggests he’s more than ready for a full-time NHL role. Not knowing the nature of his recovery, anything is possible though. There are also two U.S. candidates playing in the American Hockey League currently. Patrick Sieloff was assigned to the Abbostford Heat by the Calgary Flames, who have already stated they will loan Sieloff to Team USA for the WJC. Also in the A is Connor Carrick, who was sent to the Hershey Bears after three NHL games with the Washington Capitals. His loan status is not yet known, but the Caps once sent a young guy named John Carlson to the WJC with Team USA from the AHL and that worked out pretty well. Recurring hip trouble is sidelining Abbotsford D Patrick Sieloff, a first-year pro. “It’s an aggravation of the same injury he had last season,” said Feaster. “Unfortunately, as part of the treatment of that, he had an injection, then got an infection from the injection. He had to deal first with the infection. So he’s in Calgary working with our guys.” Feaster says the issue is preventable with a proper maintenance regimen. This is obviously something that could be of concern to Team USA as well. Sieloff hasn’t played a game since Oct. 5. As a returnee from last year’s gold-medal squad, Sieloff is obviously going to get every opportunity to make the team. He first has to get healthy, but he also has to be up to game speed in time for the WJC. He has plenty of time, but based on Feaster’s description, this could take a while for him to recover. Carrick has made eight appearances with Hershey so far and has two assists. He also scored a beauty for his first career goal in the NHL in just his second game. Assuming the Caps won’t need him around the time the World Juniors is about to start, he is more than likely going to be available to Team USA and be a big part of their defensive corps. The following players have either maintained already high standing for a spot on Team USA or are rising into stronger contention. Riley Barber (WSH) — RW — Miami University — U.S. head coach Don Lucia has to be mighty happy that top returning forward Riley Barber is off to the start he’s having at Miami this year. With eight goals and 12 points, Barber is tied for the national lead in both categories. He has been a consistent threat in every game he has played and while he benefits from one of college hockey’s best play-making centers in Austin Czarnik, Barber is showing ways to generate offense all on his own. He appears to have gotten bigger and stronger in the off-season, perhaps even possessing a bit better footspeed. Barber has more of a power game now as well, showing an ability to drive the net and finish his chances. No question, he’s going to be a huge focal point of Team USA’s offense. Jon Gillies (CGY) — G — Providence College — After a lukewarm showing at the World Junior camp this summer in Lake Placid, Gillies looks like the rookie of the Year he was last year for Providence. In four starts, Gillies is 3-0-1 which includes a win and a tie against Miami’s high-powered offense. More importantly, he’s posted a .950 save percentage and 1.71 goals-against average. Assuming he keeps this up, the net is most likely his, especially since he has WJC experience, even if it’s only 20 minutes worth. However, he is not without competition, if you’ll read the next capsule. Anthony Stolarz (PHI) — G — London Knights — Stolarz had some great moments in camp, but the body of work wasn’t the best. However, he’s off to a fantastic start in the OHL. His .925 save percentage puts him second in the league, while his 2.59 goals-against average is fifth. He also has two shutouts this year. Stolarz has hovered above the .920 mark since he joined the Knights last season. Only this time he doesn’t have Scott Harrington, Olli Maatta and Nikita Zadorov patrolling the blue line. The Knights are still a very good team, but Stolarz doesn’t have the same level of talent in front of him on the blue line. That’s worth noting. Ryan Hartman — C/W — Plymouth Whalers — Hartman, a returnee from last year’s team, had to miss this summer’s camp while recovering from off-season surgery. He seems to be all better, averaging better than a point-per-game for the Whalers in the OHL. He has 16 points, including eight goals in 15 games. Hartman has played a lot of center this year, but was a right wing on last year’s team. Hartman has some impressive two-way capabilities. The big question is will he be looked to as an offensive catalyst or a shutdown forward? He played the latter role expertly in 2013, but the needs are a bit different now. Brady Skjei (NYR) — D — University of Minnesota — After some struggles as a freshman, which included getting cut from last year’s WJC entry, Skjei appears to be thriving in a top-four role for Minnesota. He and Justin Holl have been a solid defensive pairing for the No. 1 Gophers, which have overcome huge losses from last season to get off to a terrific start to the year. Skjei has a goal and an assist, but he’s showing growth from last season. When Skjei keeps things simple, he becomes a much more effective defenseman. He seems to be doing that so far. Hudson Fasching (LAK) — RW — University of Minnesota — The true freshman has had an eye-opening start at Minnesota. I wasn’t sure how he’d make the transition, but he definitely improved towards the end of last season, so perhaps it shouldn’t be a surprise he’s been an instant impact player for No. 1 Minnesota. The Gophers needed their freshmen to step up big and Fasching absolutely has. He is third on the team with eight points in six games. Don Lucia didn’t take long to show faith in the 6-foot-2, 207-bound right wing. Fasching has been on Minnesota’s top line since the season began playing with Kyle Rau and Sam Warning. Fasching has shown an uptick in footspeed and he has shown really good hands around the net. Fasching probably isn’t a top-six caliber wing for this year’s WJC, but he’s on his way to earning a spot. Speaking of Skjei and Fasching, here is the latter scoring a nice goal against Boston College, then getting his facemask stuck to the former’s. J.T. Compher (BUF) — C — University of Michigan — It’s hardly surprising that J.T. Compher’s transition to college hockey has been rather smooth and seamless. The 18-year-old center leads the Wolverines with five assists and has found himself playing a prominent role on the team early. I’ve always thought Compher to be a leading candidate to fill a third-line center role, but Team USA may need him a little higher in the lineup if the offense continues to show as it has. Tyler Motte (CHI) — LW — University of Michigan — Motte has been thriving on Compher’s left wing, playing on an all NTDP line with Evan Allen as well. The undersized forward has a team-best four goals, three of which have come at important points in games. Motte has been used in many situations, including on the power play and his ability to score is important. However, Motte is also defensively responsible and his international experience will play to his benefit. He’s not necessarily a lock to make the team, but his stock is going up with his fast start. Ian McCoshen (FLA) — D — He hasn’t really looked like a freshman while playing top-pairing minutes for Boston College. Paired with Panthers first-rounder and Team Canada candidate Michael Matheson, McCoshen has been fantastic at both ends of the ice. He has three points so far this season, but his best play of the year came Friday night against Minnesota. With the game in OT after Thatcher Demko made a stick save on Taylor Cammarata’s breakaway, the puck took a weird hop and nearly ended up in the net. That was until McCoshen made a save on the goal line with his hands and threw the puck away. Talk about making an impression on your WJC coach. It cost Don Lucia’s Gophers the win, but he has to like that kind of heads-up play from a U.S. WJC candidate. Vince Hinostroza (CHI) — C — University of Notre Dame — A mid-camp cut in Lake Placid, Hinostroza is off to a remarkable start for the Fighting Irish. The 19-year-old freshman is leading Notre Dame with eight points, including three goals. He’s doing this despite primarily playing on Notre Dame’s fourth line. He is tied with Fasching for third among freshmen scoring leaders. Hinostroza is a high-motor player and could carve himself out a spot potentially if he finds a way to keep playing like this. Anthony DeAngelo (2014 Elig.) — D — Sarnia Sting — After getting cut mid-camp in Lake Placid, DeAngelo is off to a fantastic start in the OHL. He leads all defensemen in the league with 21 points. The next closest has 16 and DeAngelo has done this in 14 games. He has six goals and 15 assists. DeAngelo’s offensive prowess has always been known, but it’s his play in the D zone that makes him a bit trickier to project for Team USA. That said, the U.S. could really use a strong puck mover on the back end that could be a weapon on bigger ice. If he played in low-leverage situations defensively, DeAngelo has the skill to make an offensive impact. He’s earning another long look right now. This section is a catch-all of candidates covering everything from a notable tidbit of information OR why their WJC stock is holding or falling. Players listed in no particular order, so be sure to read the details for why they’re worth watching a little more closely. Nic Kerdiles (ANA) — C/W — University of Wisconsin — Kerdiles spent most of last season on the wing, but he’s currently a top-six center for the Badgers this season. He’s off to a fairly good start with five points through the team’s first four games. Will he be a center candidate for Team USA? It’s highly possible, but I think Kerdiles very well could be a better asset as a left wing, where he’s looked to primarily for scoring. He certainly has the defensive ability to play center, but the U.S. can’t afford to sacrifice much offense with its relative lack of scoring depth. Kerdiles of course is a lock to make the team, but his switch to his natural center position is something worth monitoring. Andrew Copp (WPG) — C — University of Michigan — Copp picked up right where he left off last season to star, notching six points in Michigan’s first three games. He’s been held off the scoresheet in its last three games, however. Copp is playing a much bigger role for Michigan than he did last season, centering Michigan’s top line with Phil Di Giuseppe and Derek DeBlois. He also has been a big power-play weapon. Copp’s skillset is pretty diverse, which helps his cause. His stock is in a bit of a holding pattern, but he’s certainly a noteworthy candidate. Thatcher Demko (2014 Elig.) — G — Boston College — He’s been splitting time with junior Brian Billett, so grading Demko at this point is a little more difficult. That said, the 17-year-old freshman has been strong in two starts, including some terrific play against Minnesota in a tie (though BC won the meaningless shootout). Demko was always the odds-on favorite to be Team USA’s No. 3 goalie as a player who will be eligible to go back to the WJC next year. In two starts, he has a .924 save percentage and looks like he’d give BC a better chance to win on a nightly basis. Demko has a real chance at wresting the No. 1 job full-time if he keeps up his solid play and Billett continues to struggle. Demko’s place as a No. 3 goalie for Team USA still looks pretty secure. Taylor Cammarata (NYI) — RW — University of Minnesota — Cammarata has six points in six games and has showed pretty solid skills. He’s made the most of his chances and has some really strong linemates in Justin Kloos and Nate Condon. The fact that Don Lucia is the head coach of Team USA doesn’t make Cammarata a shoo in, but he’s making a good case for himself so far. It’s so hard to predict if his game will lead to points at the WJC though. He’s produced wherever he’s been, but this is another level. Danny O’Regan (SJS) — C — Boston University — The preseason favorite to become Team USA’s No. 1 center has gotten off to a somewhat slow start, though the same can be said for most forwards on BU’s roster. O’Regan has three points in six games, which really isn’t bad, especially since the Terriers have started the year with a fairly tough schedule. He should still make Team USA, but to ease some minds, an uptick in production would help. Michael McCarron (MTL) — RW — London Knights — Points have been hard to come by for the 6-foot-5, 228-pound first-round pick of the Canadiens. He has just five in 12 games with London, with just one goal. In order for McCarron to make this team as a 1995-born, he has to be a point-producing wing. His defensive play is adequate, but Team USA needs a big-body presence to occupy the net-front and create some space out there. McCarron hasn’t been able to do that at the OHL level so far, which creates a lot of doubt he could do it at the WJC at this point. He has five weeks to show some production. Zach Stepan (NSH) — W — Through his first four collegiate games, Stepan is without a point. He started on Minnesota State’s top line with Matt Leitner, but has since fallen down the lineup a bit. He had a decent camp this summer and expectations for him to make an instant impact as the WCHA’s top recruit put a lot of early pressure on Stepan. He’s a guy who will need all of the next five weeks to show he deserves a spot. Scott Savage (N/A) — D — Boston College — Though he wasn’t invited to the U.S. WJC camp and actually was cut from last year’s U18 World Championship team, Savage has been really good for BC this year. Playing with WJC candidate Steven Santini, Savage has five points, good for third on the Eagles. The sample is too small to say much on his candidacy, but he could be worth an extra look. Savage is making good reads, solid passes and has been a real surprise so far. There always seems to be one player who missed camp in the summer that gets an invite. Savage may have put his name into that pool of consideration. Check back next week for the next edition of the U.S. World Junior Watch and click the “World Junior Championship” tag at the bottom of the post to see previous WJC coverage on United States of Hockey. This entry was posted in American Prospects, Junior Hockey, NCAA, U.S. National Teams, World Junior Championship. Bookmark the permalink. Any chance of Cole Cassels getting a look here?